I am not sure if red skinny jeans are still a "thing" in the world of fashion trends. I know they were leading the popular pack a few years back, about the time when I actually bought the ones I am wearing today. It seems distressed/destroyed denim are currently the crowd pleaser and getting the most applause as of late. Two of my favorite pair of jeans are actually the ones that are worn in with a few holes on the knees, but sometimes it's fun to go bold. Adding my beloved chambray top, Converse sneakers and some pops of print kept this style comfortable and current. So, what do you ladies think? Am I behind the curve? Should I throw in the towel on red skinny jeans? Are they a fad of the past? Okay, don't answer that because I just can't seem to let go of these pants and think they still deserve some love and attention. P.S. Does this post title make you want sing a certain song? I think you look super cute in your red jeans. Love the red with the light blue. It all looks great! I can't get rid of mine either, love the look. 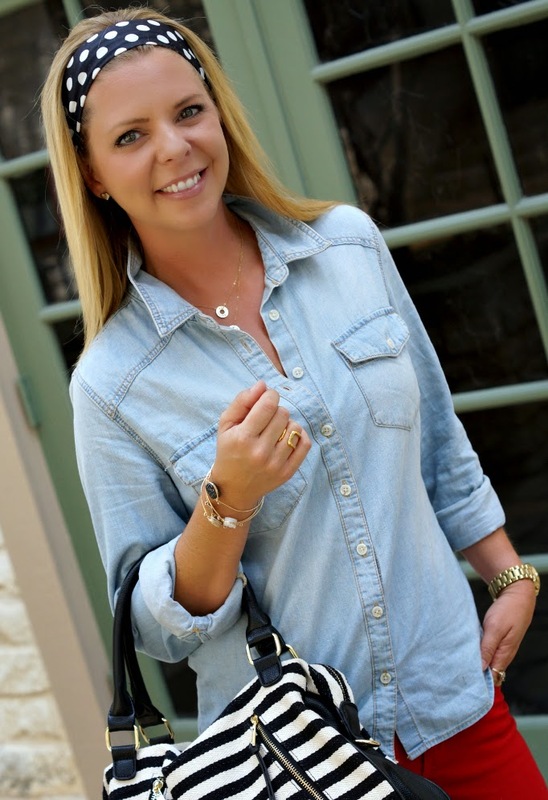 You are so adorable - loving this casual look on you! You look ravishing in red, love! Forget being in style. Those red jeans look amazing on you! With the polka dots I can't imagine anything better. I'm so glad I'm not pregnant anymore because now I can start copying your outfits again! LOVE THIS and that headband is adorable! Shanna - this is honestly my FAVORITE outfit you have ever worn! You look ADORABLE!! I think your red pants rock! You keep on wearing those. Love everything about you, girl! Have a great week!!!! KEEP the red jeans!! This is my kind of outfit, girlfriend! Keep 'em for sure! I love them. And you styled them perfectly!!!! The red jeans are a keeper! 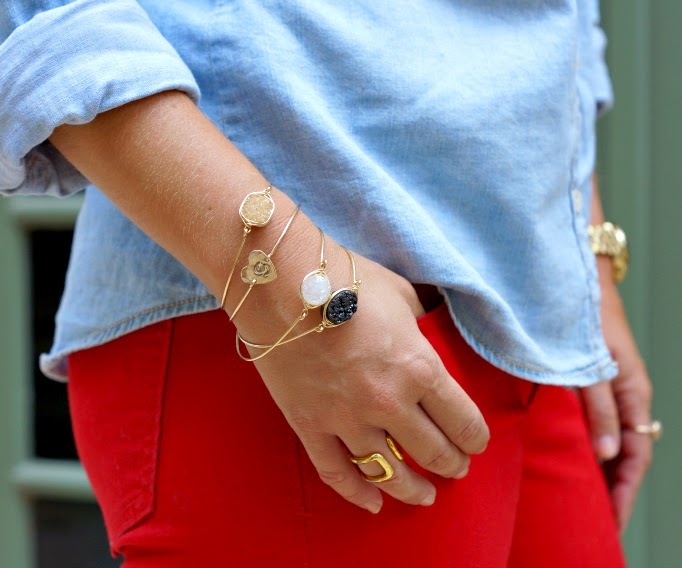 Love this relaxed look on you! The pattern mixing compliments the red so well! Loving this whole look! 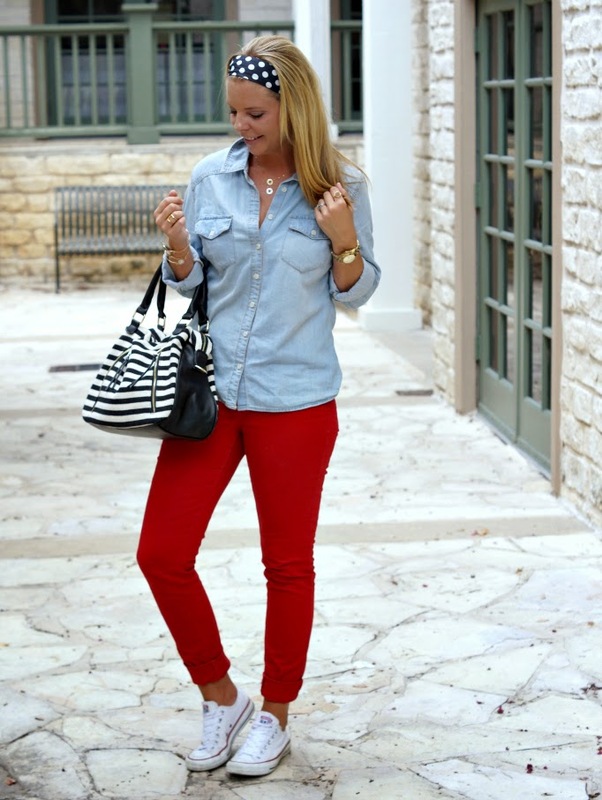 The red pants look pretty sweet with the chambray, and that headband is so cute! Happy Monday! Those jeans look FAB on you! I think red skinnies will always been in style! You are my most fav fashion blogger! Actually I think you are the only fashion blogger that I follow and love dearly! :) So cute! I think they look great, especially casual like this. No, I love this! I know what you mean about colored jeans being around for a while, but something about it being a basic color makes it more "classic" than "trendy" if that makes sense. Plus I love it w/ the stripes and shoes - love all of it! Keep em!! I think red jeans are cute. I got a pair (late to the ballgame of course) but I really like them. Red is just a really good color. Ooo I love the red pants...and they look so cute on you. Keep them for sure! Such a cute outfit!!! I love the red white and blue! you look like an all american girl!! 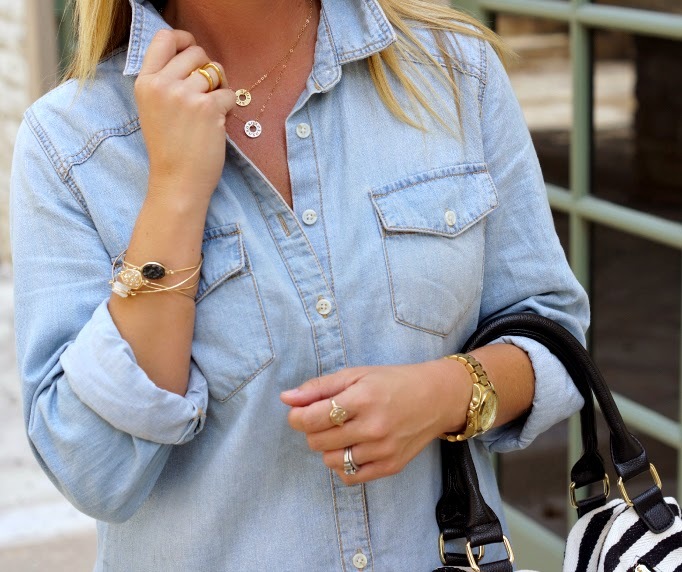 love this and I think colored denim is definitely still in! I think you're bring back the red pant trend! I think that the bold pant really elevates this casual look! You look SO chic darling! 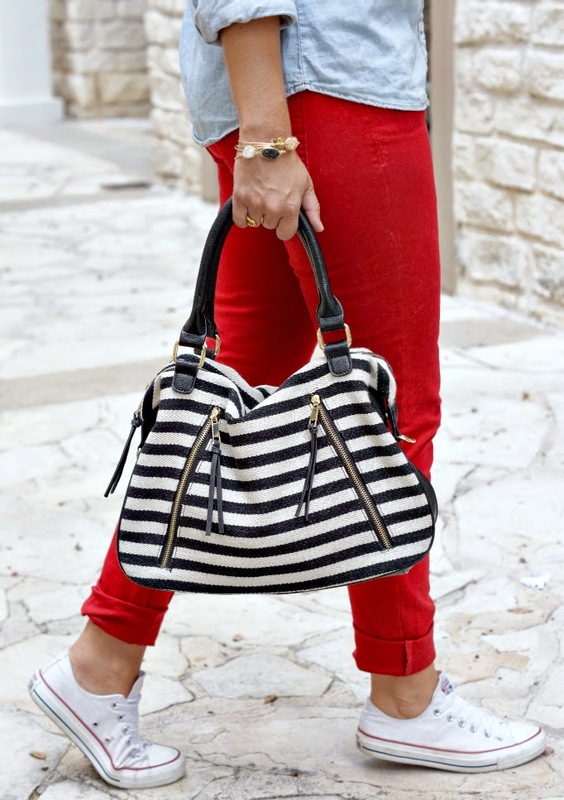 Love the striped bag and polka dot headband! 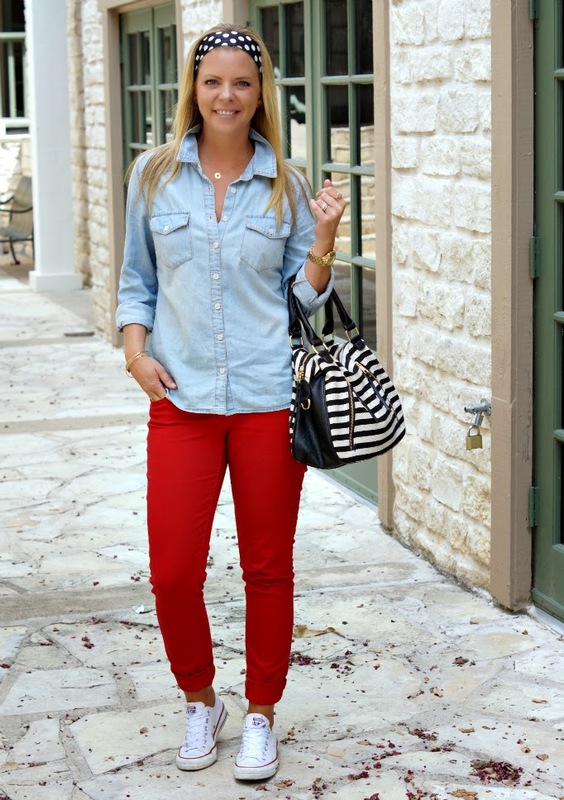 I love colored denim! I am kind of sad that they are not as popular anymore... I never want them to go out of style! You look darling! This oufit combo makes me do the emoji with the open mouth and heart eyes. naaaah! you can always make colored denim work. i love the look! I still love red pants:) I say who cares what the rest of them think, wear what you love! Also, thanks for getting Taylor stuck in my head now...lol! I personally love red jeans, cords, etc.! I say wear em'! And they look great with the white converse! yep, I have Taylor Swift stuck in my head right now! Super, super cute outfit... I love that headband! :) And you are never behind the times - this outfit is right on the money! If most people say get rid of them, pleeeease don't share as I have the exact same pair, and I still wear them and love them, besides if they look great on you that's what fashion it's about, who really wants to look like we are all wearing uniforms? It's funny that you mention the colored skinny jeans still being in style. I was shopping online today and was looking for a few colorful options and none! I don't care - I still love them. I love that shade of red and the polka dot headband is perfect. Oh Shanna I have a closet full of colored pants and I stopped wearing them! But I do think red and cobalt blue is a bit of a classic color. You look fab in them, most defiantly a keeper. Oh I am loving the bold red jeans on you! And the headband is super cute! Well hello cutest outfit I've ever seen! Do NOT get rid of them. I love the red skinnies and the headband! Such a cute outfit! I was actually just looking at a striped diaper bag that looks a little similar to this bag! It's so adorable! I love how you styled those red jeans. I'm hoping to wear mine soon. Love the polka dots and the converse! I don't think I will ever give up on my skinny jeans. I actually just got a black pair from Target that have a bit of sheen and they sooorta look like leather leggings and I'm in love. And yes ma'am to that song! I heard recently that chambray is 'out', but I don't care! I still love it. I say wear what you want to wear, and you make everything look good. It's the the clothes that make the girl, it's the girl that makes the clothes! 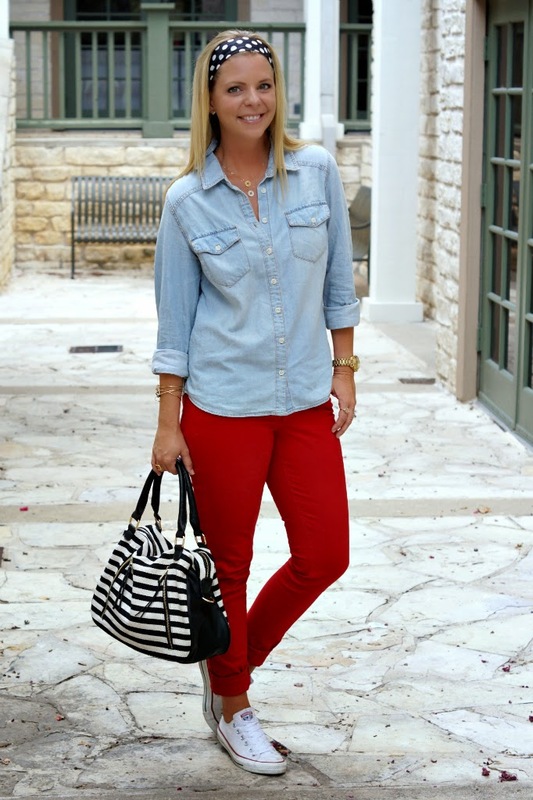 Not sure if red jeans are "in" anymore, but these look awesome on you! The polka dot headband is adorable.